Underpass Park is step one in a wider revitalization of the less-than-beautiful West Don Lands area. Once a shabby, forgotten corner of the city, the area under and around the Eastern Avenue, Richmond, and Adelaide overpasses is now undergoing a major revitalization. Although Underpass Park hasn’t officially opened, Waterfront Toronto has confirmed that the two eastern-most sections are almost complete and will become available to riled-up kids and harried parents alike later this summer. The park will feature a skateboard park and half courts, a community gathering area, and a play area featuring unique jungle gym equipment. A piece of suspended public art by local artist Paul Raff is also set to be installed within the next month (it will be reflective, to attract what light is available). The final section by St. Lawrence Street, a green space, will be unveiled in September. Waterfront Toronto’s Meg Davis admits that the area under the overpasses were considered “derelict” and were not originally part of the organization’s West Don Lands revitalization project. But when a developer submitted a plan for the space, the wheels started turning. With new affordable housing going in just north of Underpass Park—and 50 per cent of those residents expected to be families with young children—Davis said that the park will serve the new neighborhood well. 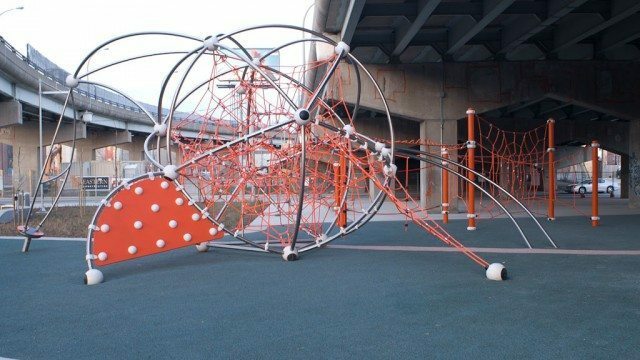 “Wouldn’t it be great on a rainy day your kids are driving you crazy…you can go to Underpass Park and play on the playscape and be weather protected and the kids can get activity and get out of your hair, so to speak,” said Davis. Diane MacLean of the Regent Park Community Health Centre agrees that Underpass Park will be a welcome part of the redevelopment of the wider area, including the West Don Lands and Regent Park. MacLean hopes that by injecting life into the underpasses, a sense of safety and ownership will be restored. She would also like to see Underpass Park become part of a Discovery Walk that would further connect Regent Park with the wider community. It appears at least that the project is unaffected by the political circus that the Port Lands inspired last summer and the “accelerated” plan for development there. “The City, the feds, and the province are all cooperating with us nicely on this project, on the West Don Lands and on Underpass Park,” said Davis. Underpass Park will officially open in July.